As Gloria Díaz explained in a previous article, the idea of a meeting of circus women at the state level had arisen from a shared desire among several circus professionals, which led to the creation of a Facebook group, Cirqueras, in 2017, and successively, promoted the first meeting of Cirqueras, in June 2018 in Seville. In this first meeting, the foundations for further discussion were laid out and it was agreed that there is a need to create other meeting spaces. Previously, in Spain, activities related to gender were already taking place. It is worth highlighting the course on Circus and Gender within the Master of Gender and Communication of the Autonomous University of Barcelona (since 2015); or the Face to Face program on gender, where in pairs a circus artist and an expert in gender attended and analysed some circus shows (APCC 2016); or the CAU Festival that devoted its first two editions to women and circus (Granada, 2016-2017). 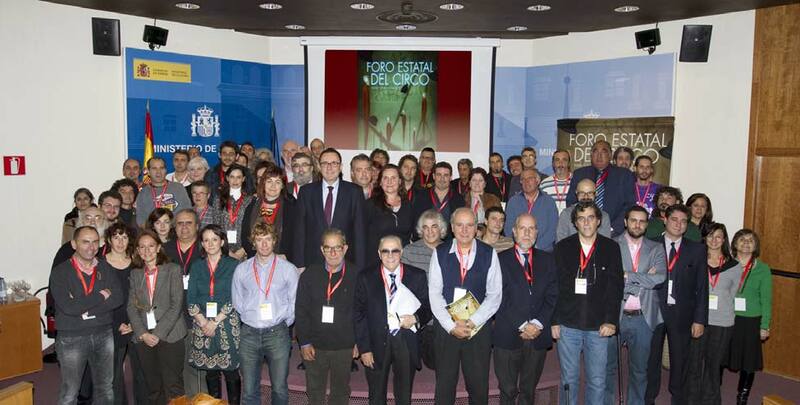 In Barcelona, there was a study day about circus and gender entitled “Who’s on Stage? 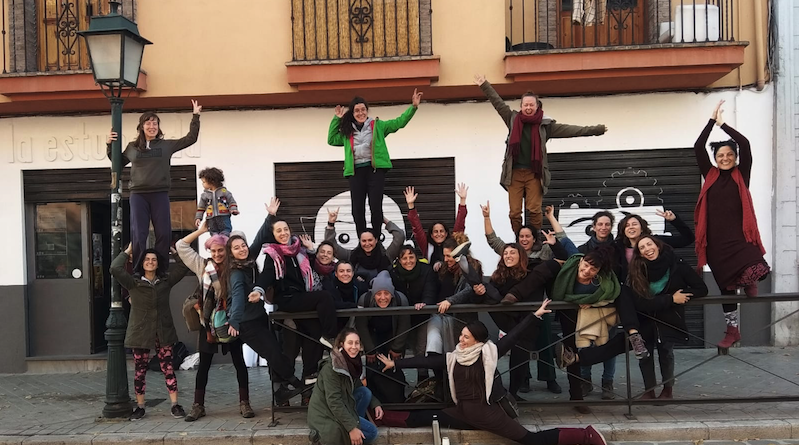 Gender, Circus and Performing Arts,” with the participation of academics, artists and activists (organized by the APCC with the support of the Mercat de les Flors and FACE, 2017), while in Madrid there were some gatherings among circus women (MADPAC, 2017). Some cirqueras (circus women) from Spain also participated in the Swedish campaign #theshowisover, with the translation of the manifesto into Spanish and the signature of several cirqueras (2017). In parallel, in 2018, Circored has seen the birth of a Gender Commission, currently constituted by Andrea Perez (APCCV, Valencian Community), Zenaida Alcalde (MADPAC, Madrid), Mai Ibargüen (CARPA, Aragon), Marina Rubiales (APCMurcia), Shakti Olaizola (Euskadi) and Elena Zanzu (APCC, Catalonia). The second meeting of Cirqueras took place in Granada from December 10 to 13, 2018. It was coordinated by Shakti Olaizola, Marina Rubiales, Yésica Balbas and Costanza Lovazzano, who took care ofconceiving and moderatingthe meeting and bridged the gap between Circored, CAU festival, the Gender Commission of Circored, the coordinators of the first meeting and all of the participants. Some 30 circus women from different parts of Spain participated. They were mostly artists, but also teachers, technicians, and producers. The first day was dedicated to getting to know and recognize each other, through corporal dynamics (by Ana Martínez) and dialogues. Then the focus was placed on the topics of empowerment and invisibility. The need for these meetings to remain closed to (cis)men was agreed upon. It was decided to create a directory of cirqueras, in order to answer the false assumption that is commonly used to not program women, namely, “there are no women.” It was agreed to make a parity study of programming of circus at the state level. Several proposals were made such as creating a feminist circus school and a women’s circus festival. The second day was focused around care. Part of this was dedicated to motherhood, with the proposal of creating a support network for mothers and a guide of good practices for the care of mothers and children in the companies. The main theme of the third day was violence – namely abuse, aggression and gender violence in circus. We discussed violence that is present in schools, companies, festivals and in all circus environments. The meeting ended on the third day, but on the fourth day, we had a space within the programming of the CAU festival to share reflections on the meeting. As part of the work, during the three days participants shared meals, breaks, shows of the CAU festival, a dinner with presentations of collective and personal projects, improvisations, informal and more intimate conversations, new and old friendships. 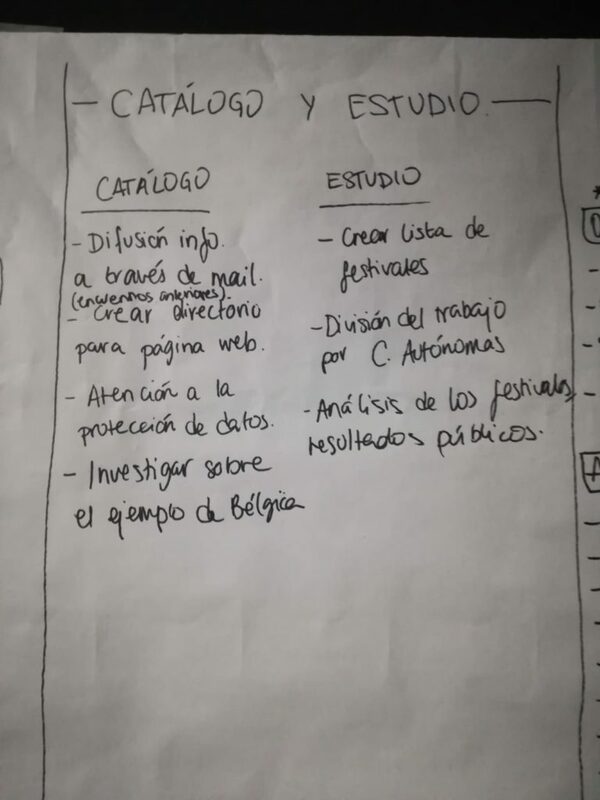 This is where some proposals were presented, such as Julieta’s idea for the creation of a programming network of cirqueras, to which the programming spaces could adhere.During the meetings and work groups, there was a person in charge of babysitting so that the cirqueras with children could participate fully in the activities. It has been agreed to continue the work of Cirqueras in three main ways. On the one hand, the working groups that have been formed in the meeting will continue working throughout the year and will update the cirqueras at the state meetings. These groups are open to new incorporations. Secondly, the intention to continue working at the local level has been manifested. Thus, the various associations of circus professionals, as well as groups of women, will organize regional meetings. And the third tool of cirqueras will be the state meetings, which are planned to be done once or twice a year. The third meeting of cirqueras already has a place and a date. Agreeing on the need for geographical rotation, it has been approved that theIII Meeting of Cirqueraswill take place in Zaragoza, from March 18 to 20, 2019. It will be supported by Etopia, Center for Art and Technology, and will take place within the framework of the Women of Circus cycle proposed by Serendipia productions and with the collaboration of the Municipal Board of Performing Arts and Image of Zaragoza. There is already a proposal of coordinating team, formed by: Mai Ibargüen, Morgane Jaudou, Ana Castrillo, Night Diéguez, Monica Marco, Rebeca Pena. Why is it important to create non-mixed spaces, such as the Meetings of Cirqueras, where we can become aware of the political nature of the injustices that we live daily in our work sector? Because circus, instead of using its power of amplification to challenge the status quo, remains a space for the reproduction of sexism. The circus sector in Spain lacks quantitative studies on gender. But some partial studies reveal to us some grotesque situations. For example, in recent years, the APCC has been conducting surveys of circus companies, that reveal how, while the presence of women in circus is almost half in companies with low income, their presence is notably reduced in companies that are economically stronger. In another 2016 APCC study, Face to Face program, a random selection of circus shows programmed in Catalonia during a trimester, was analyzed, and it turns out that 80% of artists on stage were men versus 20% of women and 0% of other gender identities. The directors of the shows themselves were nearly 100% cis-men. Circus is a highly masculinized space in the positions of power. According to a qualitative analysis, we know that circus in Spain, continues to represent genders in a stereotyped way. Bodies are idealized under a patriarchal cis-hetero perspective, training schools follow the tendency to divide circus disciplines by gender, male costumes tend to cover more skin whereas female costumes tend to be more revealing and the dramaturgies of circus continue to represent cis-hetero love stories. Cis-men continue to win the circus awards, to direct festivals, and to run the associations and creation centers. And, in the same way, cis-men write circus (directors), write about circus (journalists) and decide about circus (politicians). In other words, circus is revealed as a space for reproducing sexism in all areas. There is an invisibilization of people who are not cis-men in history (history vs. herstory or theystory); an underrepresentation of those who are not cis-men on stage; a predominant presence of gender stereotypes in all dimensions of the circus activity (disciplines, characters, dramaturgies, costumes, training, etc. ); an underrepresentation and stereotyped gender representation of circus in the media and an underrepresentation of people who are not cis-men in decision-making. That is, those who tell us the stories (historiography, direction/dramaturgy, journalism, politics) are predominantly cis-men. Circus is already a discriminated sector within the arts and it is also no exception with respect to the treatment of gender: here also people who are not cis-men, are discriminated against and made invisible. And if we are racialized, older, fat, lesbians, disabled, etc., we add an axis of discrimination. It is necessary to have an intersectional approach that forces us to review our own privileges. If in the meetings of cirqueras the majority of the participants are white, cis, straight, young, with normative bodies, abled, neurotypical, etc., where are others, what mistakes are boing made and what needs to be done to create a truly inclusive and accessible space? Clearly, we are all educated into the hetero-patriarchy and other forms of oppression. It is imperative to be vigilant and to conduct self-criticism. While we must see in a positive way the fact that there is a new “gender fashion”, we must be vigilant so that this does not translate into a banalization of the struggle. If now, luckily, there are more festivals and theaters that declare themselves allies of feminism and want to give a space “to women” (see the proliferation of circus galas of women), the risk is that these spaces are occupied by projects that help award feminist-friendly medals without really working toward a change. Therefore, we must continue to work critically and collectively. Cirqueras, because of its collective, free, critical and rotating nature, could be an important agent in this direction. 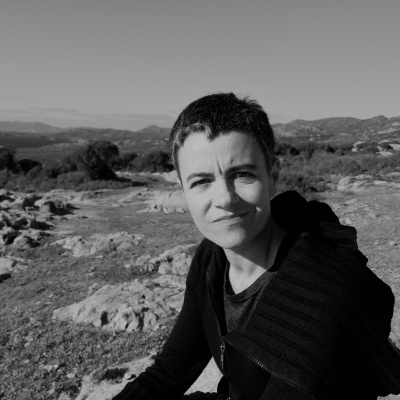 Elena Zanzu es una artista, investigadora y activista. Sus intereses de investigación prácticos y teóricos giran en torno al género, la discapacidad y otros ejes de vulnerabilidad. Master en Filosofía, está especialmente interesada en las intersecciones entre práctica artística y filosofía. Elena Zanzu is an artist, researcher and activist. Her practical and theoretical research interests revolve around gender, disability and other axes of vulnerability. She has a master's degree in philosophy, and she is especially interested in the intersections between artistic practice and philosophy.